THE HOTTEST PEPPER ON EARTH!!! 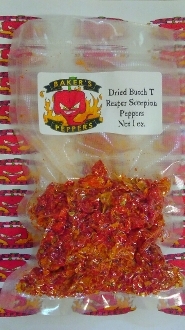 We now have Butch T Reaper Scorpion Red dried peppers available in these 1oz packs! This pepper was created by Butch Taylor and is the NEXT World's Hottest Pepper! Created from the Carolina Reaper & a Trinidad Scorpion Butch T. These peppers have been cut in half and stems removed prior to being dried! These peppers weigh in at OVER 2.1+MILLION S.H.U.!! Very nice flavor along with SEARING heat! Order yours TODAY! !